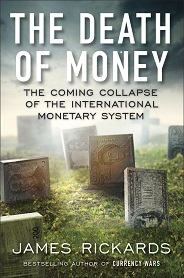 The title will no doubt give Cobden Centre readers a feeling of déjà vu, but James Rickards’ new book (The Death of Money: The Coming Collapse of the International Monetary System) deals with more than just the fate of paper money – and in particular, the US dollar. Terrorism, financial warfare and world government are discussed, as is the future of the European Union. Though he quotes F.A. Hayek a few times, the Austrian School gets only one mildly disparaging mention in the entire book. This seems odd for an author who devotes a whole chapter to the benefits of the gold standard. His first bestselling book, Currency Wars, argues that currency wars are not just an economic or monetary concern, but a national security concern for the USA. He makes the case for the US federal government to reinstate Depression-era restrictions on banking activities and for most derivatives to be banned. As a former Federal Reserve Chairman, Paul Volcker, said in 2009, “the only useful thing banks have invented in 20 years is the ATM” – a sentiment Rickards would probably be sympathetic to. More interesting is the author’s attempt to map out what-happens-next scenarios. The chapter about the on-going transformation of the International Monetary Fund into the world’s central bank, and Special Drawing Rights (SDRs) into a global currency, is particularly insightful. Though Rickards doesn’t say it, Barack Obama’s former chief of staff (and current Mayor of Chicago) Rahm Emanuel’s dictum about never letting a crisis go to waste seems to apply here: hostile acts of financial warfare would lead to calls for more international regulation, and to more government intervention and monitoring of markets. Observers of the EU’s crab-like advance over the last half century will be familiar with the process. Indeed, my only quibble with this book is Rickards’ starry-eyed take on the EU – soon to be “the world’s economic superpower” in his view. Though he makes a good argument – similar to Jesús Huerta de Soto’s – that relatively-tight European Central Bank monetary policy is forcing effective structural adjustments in the eurozone periphery, as well as in eastern states that wish to join the euro, his endorsement of other aspects of the EU seem too sweeping. The author talks of the benefits of “efficiencies for the greater good” in supranational government, and how subsidiarity makes allowances for “local custom and practice”. But, as the regulatory débacle surrounding the Somerset floods has shown recently, EU rule frequently licenses bureaucratic idiocies that destroy effective, established national laws. Regulatory central planning for an entire continent is, I’d say, just as suspect as monetary central planning for one country. The continent’s demographic problems are probably containable in the short-term, as Rickards says. But mass immigration is driving increasing numbers of white Europeans to far-right parties. And while there is consistently strong public support for the euro in the PIIGS (Portugal, Ireland, Italy, Greece and Spain), he’s silent on the broader question of the EU’s democratic legitimacy. No mention of those pesky ‘No’ votes in European Constitution, Maastricht and Lisbon Treaty referendums – or of the Commission’s own Eurobarometer polls, which show more and more Europeans losing faith in “the project”. No matter I suppose: the eurocrats will rumble on regardless. But what was that quote about democracy being the worst form of government apart from all the others? (1) For example Juárez, Fernando (2011). “Applying the theory of chaos and a complex model of health to establish relations among financial indicators”. Procedia Computer Science 3: 982–986. Actually this person is a good example of the enemy of my enemy is NOT my friend. It all sounds wonderful “down with the Fed”, “down with the debt”, “down with the banksters” – but as one looks more closely it becomes clear that one is not dealing with a friend. Not a friend of the Austrian School of economics, and not a friend of British independence from the European Union either. As for the E.U. Central Bank – it is (at heart) no different in its basic ideology from the Bank of England or Federal Reserve. At least this gentleman does not push the “you would be worse off if you had not joined the E.U. – my mathematical model proves it….” as the Economist magazine was doing this week (pushing a mathematical model that they actually admitted was partly based on data from ARGENTINA). The E.U. is an extra layer of government – and the vast majority of new regulations come (in one way or another) from the E.U. Anyone who pretends that the E.U. is a good thing, rules themselves out of serious economic discussion. At one time it may have been true that “democracy (is) the worst form of government apart from all the others?” But that is no longer the case. Possibly only a Second Amendment loving Yank such as myself can appreciate the wisdom behind these quotes of Benjamin Franklin’s: “Democracy is two wolves and a lamb voting on what to have for lunch. Liberty is a well-armed lamb contesting the vote.” The former French Ambassador also wrote: “When the people find that they can vote themselves money, that will herald the end of the republic.” And this: “They that can give up essential liberty to obtain a little temporary safety deserve neither safety nor liberty.” The man unafraid to go fly a kite even in a thunderstorm also wrote: “Where liberty dwells, there is my country.” And “God grant that not only the love of liberty but a thorough knowledge of the rights of man may pervade all the nations of the earth, so that a philosopher may set his foot anywhere on its surface and say: This is my country.” So at least, these first three quotes from the good Doctor would suggest that democracy as now abused is at best no better nor worse than any but a brutal dictatorship such as enjoyed by the likes of Hitler and Stalin. Mr Thompson please remember that the unlimited Welfare State was NOT the idea of the people – they did not wake up one morning and say to themselves “let us vote ourselves money”. The people were told (in all major Western nations) by the intellectual elite (the education system and so on) that setting up “social insurance” systems was wise and sensible – and the media supported this also. The people just went along with it – even today the government (at least in the United States) spends a lot of money and effort PUSHING its welfare schemes (getting people to sign up for “what they are entitled to”). Would the people go along with restricting this (ever increasing) spending – or have the people got used to it? Come to depend on it? The decline of Civil Society (of voluntary associations looking after old age, health care and so on) and the rise of the state – not for a few unfortunate people (as in the 19th century), but seeking to provide all the basic things in life for the vast majority of people. And the state can not provide the basic things in life for the majority of people – it is not possible, that is the true source of the future societal crises, of which even the financial crises (the credit bubble financial system – which no longer is based upon real savings)is only a sign.